One of the best parts about summer is the endless trips to the beach. However, just because summer eventually comes to an end doesn’t mean you can’t enjoy the beach all year round. Believe it or not, achieving the perfect beach theme doesn’t require pounds of sand and a close-up view of the beach. Simple things such as jars filled with sand and shells can help add to your whole beach aesthetic. The key to this theme is to keep the colors light and bright. Switching up your floors to a white or beige wood is one easy way to alter the entire look of the room. 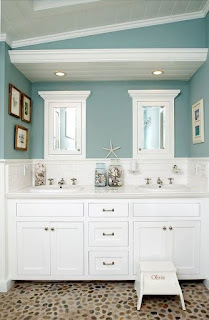 Filling the bathroom with your favorite parts of the beach is the best way to make this your ultimate paradise! If you’re looking for a place to escape from the stress of a long day, going with an outdoorsy jungle theme is the perfect way to achieve a true sanctuary for relaxation. Changing your walls and floors to a dark stone or brick can really turn the entire look of the room around. In addition, adding a bunch of different types of green plants are a must-have to get the ultimate jungle theme. Mimicking waterfalls with a cascade-style faucet for bathtubs and sinks can also provide soothing sounds that will take your mind on a trip outdoors. For this theme, even the lighting can play a huge role. Having low lighting or focusing on natural light will give the illusion that you’re outside. With this combination, you’ll feel like you’re miles from home! There’s no doubt that the futuristic, clean, simple look is all the rage these days. 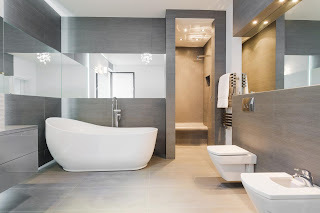 Going for a modern bath is a great way to make the bathroom a place where you can go to relax and unwind. A timeless design, remodeling your bathroom in this theme will upscale the look of your entire home. The key to achieving this particular theme is to keep things simple and stay away from patterns. Whether you love a mix of shades or want to go for an all-white theme, it’s important to stick to neutral shades such as black, white and gray. Switching out your bathtub to one that is freestanding and spacious is a quick way to turn this theme into a reality. 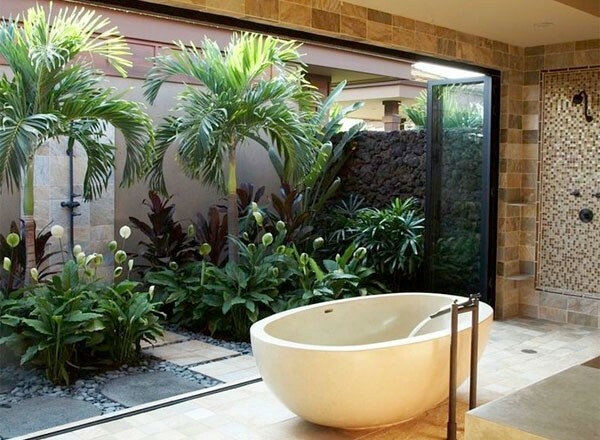 Not only is it perfect for long baths, but it can also contribute to the overall look of the room. Create the illusion of space by using big vanity mirrors and glass shower doors. Not only will it make the room seem bigger, but it will also help you feel more relaxed! 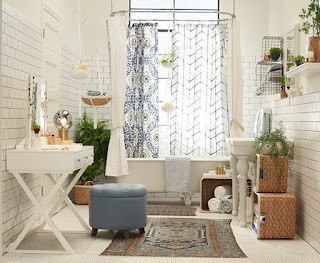 If you’re not one to stick to trends and basic decorating styles, going with a bohemian theme is a great way to explore new things that stand out from the typical bath. This carefree, earthy theme is perfect for those who have a traveler’s mind. With a focus on experiencing new cultures, there’s no right way to reach the bohemian style of decorating. The important thing to remember is that this theme heavily focuses on intricate patterns and designs. Filling your walls and floors with detailed art is a great way to get started. You can also place a few plants here and there to add to the aesthetic. In addition, things like beaded curtains are a good final touch to really go all in on this style. For those who are just looking for a simple remodel to revamp their bathroom, going with pastels is a simple way to upgrade without completely transforming it. 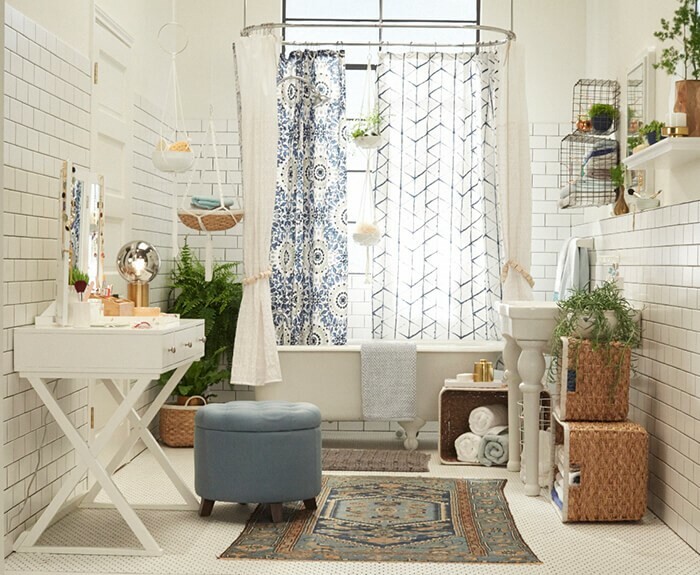 This is perfect for those who want to clean up the overall bathroom look without the intention of creating a weekend getaway spot. This is also great for smaller bathrooms (all other bathrooms other than the master bathroom) that just need a little help. Painting the walls white or any pastel color can create a clean, soft look for the entire room. We recommend going for the white walls and adding pastel colored towels, cabinets, mirror frames or flowers. This simple theme is super easy and fun to achieve. When remodeling your bathroom, it’s important to remember that you don’t have to do it all at once. One of the best things about a bathroom remodel is that you can take it step by step. 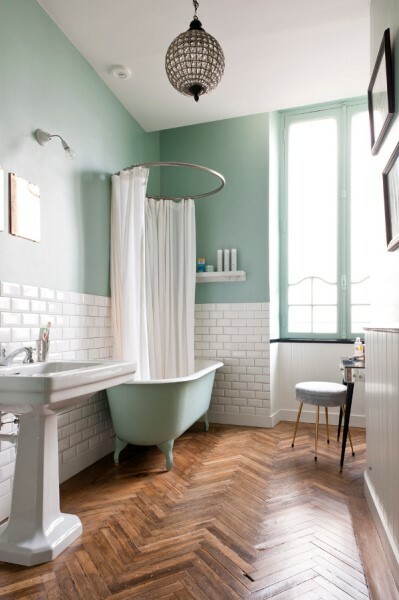 Even changing simple things like the sink, tub or wall color can completely transform the whole vibe. After all the hard work you put in, you’ll have the ultimate relaxation spot in no time!